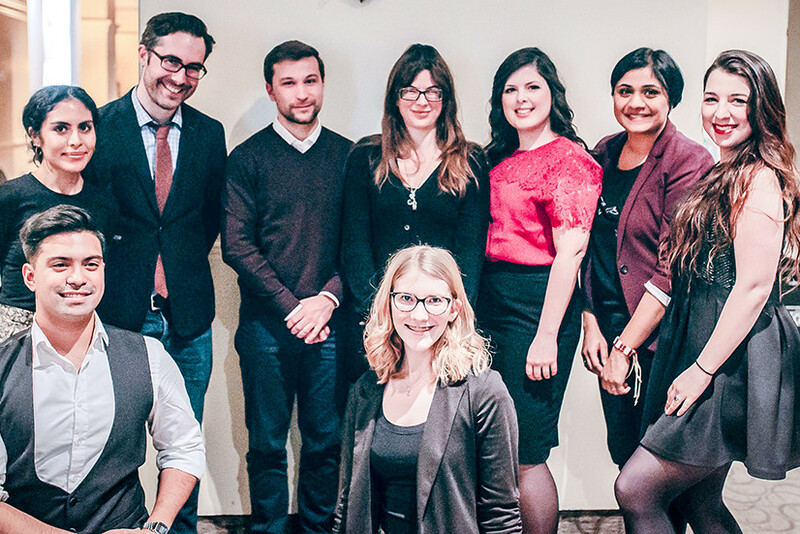 Top row, second from left: Jonathan Montpetit, CBC Reporter; Gabriel Nadeau-Dubois, Québec solidaire candidate; Catherine Leclerc, French Language and Literature professor at McGill University; Ariane Cayer, former Parti Québéquois youth committee president. Photo by Kirubel Mehari. Gabriel Nadeau-Dubois wants to protect French. “Because of the age we live in, with more and more reciprocal influences and therefore potential for cultural imperialism, we must institutionally put in place structures that permit protection of cultural features, such as the French [language],” said panelist and now-politician Nadeau-Dubois at last Tuesday night’s panel, The Changing Landscape of Language in Montreal. The night’s record-setting blizzard did not stop the student-organized School of Community and Public Affairs Panel from asking if the spirit of Bill 101 is still pertinent today. The evening’s three panelists explored the contribution of the English and French languages to the Quebec identity and how to solve the employment issues, for those who are not bilingual, in Montreal. They included Nadeau-Dubois, who recently announced his bid to run as a Québec Solidaire candidate in the 2018 provincial elections and is known for his participation in 2012 student strikes. McGill’s French Language and Literature professor Catherine Leclerc and former president of the Comité National des Jeunes du Parti Québécois Ariane Cayer also spoke. The panel comes at the right time—2017 marks 40 years since the passing of Bill 101. In 1977, French was made an official language of the Québec courts and of the provincial government. Between the years 1963 and 1969, the Royal Commission on Bilingualism and Biculturalism emerged in response to the history of unequal treatment of the French-speaking population in Canada. The commission made progress by advocating for bilingualism within government, equal opportunity to become bilingual and better cultural relations in public and private sectors of the country. Montreal’s cosmopolitan roots come largely from this history of French and English speakers cohabiting, though not always cordially, in what is now a predominantly francophone province, a result of the Bill. Setting a respectful tone for an evening of progressive discussion, each panelist introduced their initial opinions on the evening’s topic, all largely agreeing on hopes of a peaceful cohabitation between Francophones and Anglophones throughout all of Quebec. Leclerc explained how the linguistic issues, often described negatively, are under a strained political and social state in Montreal. “The way that you view the world is formed and created by language”—English as a second language teacher, Andrew Chamber. Nadeau-Dubois recognized that much of the tension comes from a desire to protect a language and a culture. On the individual level, Nadeau-Dubois explained that practicing more than one language is strictly a positive thing. Being multilingual presents young people with tools for a career as well as gives them access to other cultures and other universes. The individual level, he furthered, must be distinguished from the institutional and collective level. “At the institutional level,” Nadeau-Dubois said, “it’s important to conserve [in] a common base for democratic reasons.” A shared space with a common language is important for communication, cooperation and common identity. When asked about his experience in English classrooms, an undergraduate student in Applied Linguistics, and an English as a second language teacher, Andrew Chambers, said that the tension is engrained in the elemental differences of the very languages themselves. Unilingual people are bound to the sole universe their language limits them to, he explained. From a word’s ability to represent an object or emotion, to the very pronunciation of the word itself, meaning is given to the world around us by the way we think symbolically through language. The English and French languages have many words in common, due to their historical and geographic proximity. But, Chambers said, there are also inherent differences. “English favours closed syllables, where we cap our vowels with consonants and French being the opposite, favouring open syllable,” he explained. The result, he said, is a love-hate relationship. English is the business language of the world, said a study done by international school Education First. They found that it’s spreading and is in no danger of dying out anytime soon. Nadeau-Dubois said Quebecers are not the first to fear for the loss of their cultural identity, as a result of the American influence that permeates so many cultures worldwide today. Cayer, a former junior PQ politician, noted that while Quebecers are worried for the survival of their cultural identity, there are also many allophone immigrants who must be accommodated in the province. Politically, the field becomes more complex when taking into consideration the precarious state of Canada’s Indigenous languages and cultures. “We are not in a position to tell the [Indigenous populations] how to protect their languages, after having done so much collectively, so that it disappears,” Leclerc said. Although it would be economically efficient for everyone worldwide to speak the same language, Nadeau-Dubois said that this concept fails to take into consideration the non-economic value of diversity. In the future, Cayer said she hopes to see more accessibility to French schools. Nadeau-Dubois expanded on that, offering the idea of making French lessons free in Quebec. There was no one solution among the panelists of how we might reconcile the linguistic landscape of Montreal while still accommodating unilingual speakers. These inquiries seemed to expose a web of interrelated issues that raised more questions from other fields of research. The complex history of cultural discourse between Quebec’s English and French populations cannot be solved so simply. To a small degree, this panel proved that a community could revolutionize its identity through changing landscapes towards solidarity.